Cyber Acoustic's Curve Series powered 2.1 speaker system, called the Curve STORM +, delivers a powerful solution to great audio in the home. Ideal for music, movies and games. Kick back and enjoy quality sound you never knew you were missing. The twin 2"" high-efficiency drivers per satellite deliver crisp highs, while the 3.75” subwoofer provides booming bass with a punch. This speaker system comes with a convenient control pod to keep all controls at your fingertips. The control pod has power on/off, volume control, auxiliary input, and a headphone output jack. 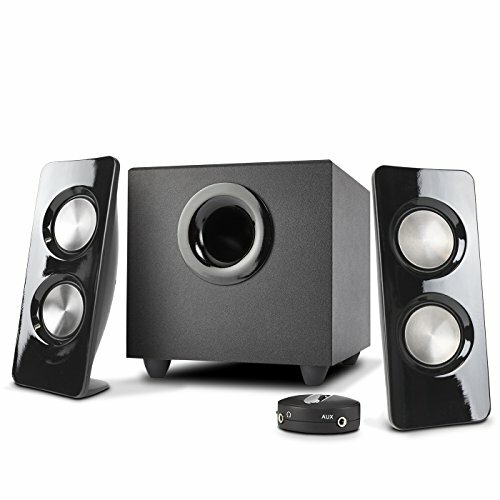 With easy set up and 1 year coverage by Cyber Acoustics, the CA-3370A speaker system is the best answer to the audio solution you have been looking for. Cyber Acoustics is a manufacturer of speakers, headsets, headphones, and microphones. Our commitment to today’s lifestyle technologies reaches back more than 20 years in developing and delivering computer related products found in homes, businesses, and schools across the country. It's easy to make great audio products when price is not a factor. The real challenge is in the hard work and engineering, combined to deliver the very best in performance, that also happens to be the most affordable. It’s what drives us… creating that thrill found in the first moments of discovery – of expectations blown away. ROOM FILLING SOUND: Driven by an acoustically optimized internal power supply, this subwoofer speaker system delivers 44 watts peak power and 22 watts RMS. With this kind of power you can expect quality sound at any volume level, filling any large room in the home or office. EASY TO USE: The convenient control pod gives you full control over your sound system. Adjust the volume, turn it on and off or use the headphone output jack for those private listening moments. With easy access to the 3.5mm auxiliary input jack, you can quickly connect your cell phone, tablet, MP3 player, or gaming system to really pump up the sound. Separate bass volume control is located on the subwoofer, enabling you to fine tune the sound just the way you like it. RICH AUDIO: The ported 3.75" subwoofer delivers some of the deepest bass available, powerful for any audio experience, combined with satellites using twin titanium styled drivers for crisp, clean, optimized sound quality. HIGH QUALITY DESIGN: Inspired from today's curved electronics, our curved design is the latest in styling and optimized sound characteristics. QUALITY GUARANTEED: Includes 1 year hassle free warranty. AC power 110V only. If you have any questions about this product by Cyber Acoustics, contact us by completing and submitting the form below. If you are looking for a specif part number, please include it with your message.